I go this recipe from Facebook. My manger showed me and said we should make them in the store. So I made them the other day at home. I did modify the recipe. The balls came out Really good almost like fake Reese Peanut Butter cups. 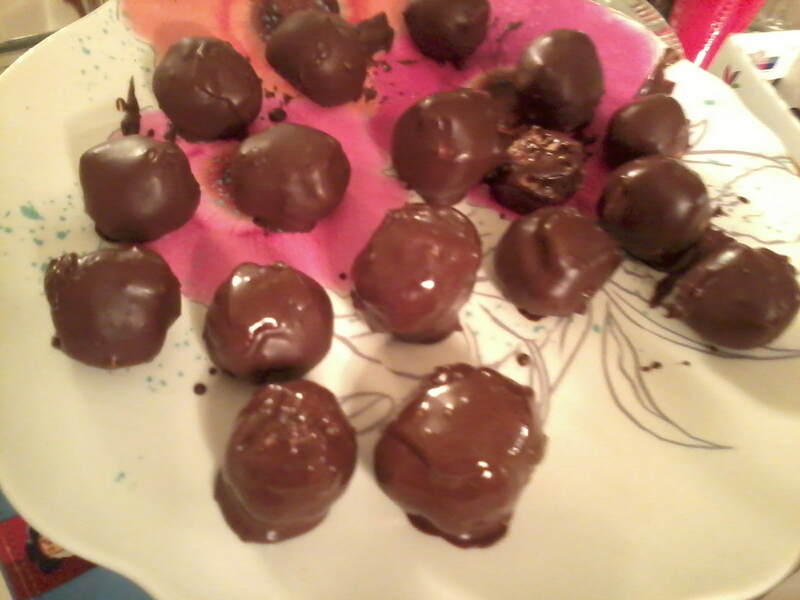 and I know what I am giving some of my Friends for Christmas, Deav’s Salt Chocolate Balls. Which are really called Buckeyes, as I was informed by on of my co-workers. But I digress, below is the orginal recipe and my modifications. Overall the recipe is easy and very delicious. If you are going to a holiday party this year I would say makes these delecious devils and keep the stress low. The do store well and later this month I will try to ship a few to friends to see how they hold up for shipping. 1 box of Milk chocolate Truffles From Harry and David. In a large bowl, stir together the peanut butter, confectioners sugar and melted butter until the mixture is crumbly. For the next step, the best way that I’ve found to make a smooth filling is to use your hands to mix everything together. Line a baking sheet with foil. Roll the peanut butter filling into 1 inch balls and line the baking sheet with rows of the balls. Set the baking sheet in the freezer for 5-7 minutes to chill the peanut butter balls for easier dipping. • I let them Freeze for about 20 minutes. While the peanut butter balls are chilling, melt the chocolate in the microwave in a microwave safe bowl that is deep enough for dipping. I melted 6 blocks of chocolate almond bark at a time, stirring at 45 second intervals until smooth. Remove the baking sheet from the freezer. Insert a toothpick or wooden skewer into a peanut butter ball and then dip it into the chocolate, turning quickly to cover the entire candy. Place onto a second baking tray that has also been lined with foil. Swirl the chocolate on the top of each candy for a pretty design. Refrigerate until the chocolate had completely dried. Store the candies in a sealed container in the refrigerator. **Warning** These little candies are very addictive! !